Varanasi grew as an important industrial center, famous for its muslin and silk fabrics, perfumes, ivory works, and sculpture. 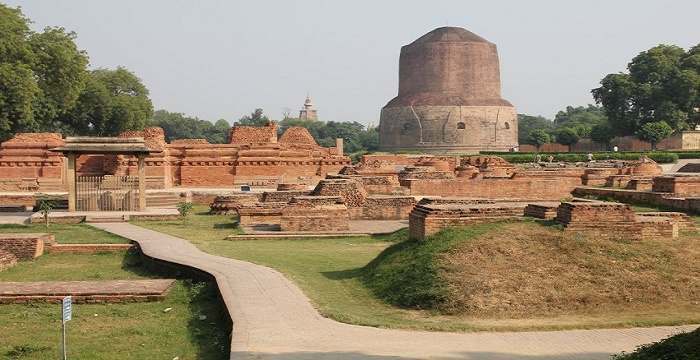 Buddha is believed to have founded Buddhism here around 528 BCE when he gave his first sermon, “The Setting in Motion of the Wheel of Dharma”, at nearby Sarnath. The city’s religious importance continued to grow in the 8th century when Adi Shankara established the worship of Shiva as an official sect of Varanasi. During the Muslim rule through middle Ages, the city continued as an important center of Hindu devotion, pilgrimage, mysticism, and poetry which further contributed to its reputation as a center of cultural importance and religious education. Tulsidas wrote his epic poem on Rama’s life called Ram Charit Manas in Varanasi. Several other major figures of the Bhakti movement were born in Varanasi, including Kabir and Ravidas. Guru Nanak visited Varanasi for Maha Shivaratri in 1507, a trip that played a large role in the founding of Sikhism. The holy city of Varanasi attracts pilgrims from far and wide. However, many people come to this place lured by the various Monuments in Varanasi. Each of these Varanasi Monuments has a class and history of its own. So, it goes without saying that your Varanasi Tour would not be a complete one unless you visit these Monuments in Varanasi. Amongst the Monuments of Varanasi, Uttar Pradesh, India. These are few of the most historic and must visit heritage sites in Varanasi. One of the famous monuments in Varanasi, Ram Nagar Fort was built in the 18th century by Maharaj Balwant Singh on the bank of river Ganga. The fort displays the combination of both Hindu and Muslim form of architecture. This fort is splendidly built in red sandstone. The Durbar hall museums and the temple are main attraction of the fort. Dhamek Stupa is a massive stupa located at Sarnath, Stupas originated as pre-Buddhist tumuli, in which ascetics were buried in a seated position, called chaitya. After the par nirvana of the Buddha, his remains were cremated and the ashes divided and buried under eight mounds with two further mounds encasing the urn and the embers. Little is known about these early stupas, particularly since it has not been possible to identify the original ten monuments. BHU is another place that should be an integral part of your Varanasi Tour itinerary. It was this place from where many celebrated scholars, scientists as well as artists got their education and got an insight into their true calling. So, this leading seat of education in the country is a place that you should not miss to visit at any cost. So, without any further delay, book yourself for a tour to these Monuments in Varanasi in order to experience a different facet of this city unfold before your eyes. Do not forget to maintain a journal throughout the trip because you are going to be overloaded with knowledge during this trip.